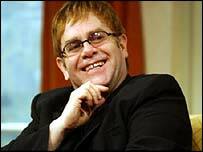 The singer Sir Elton John is to play at a concert in Ipswich next summer. The pop star's performance will be at Ipswich Town's Football Club's Portman Road stadium on 16 June. The concert will be the first at the stadium for 12 years. Ipswich Town's chief executive, Derek Bowden, said it could be the first of many. This summer the veteran singer had his fifth UK number one single with a 24-year-old song, Are You Ready For Love.